As most writers do, I read all the time, magazines, internet articles, newspapers, whatever is handy. But nothing is as satisfying as finding a really great book I can dive into and remain submerged in for days. I’m not picky about genre, but I prefer historical fiction over most other genres simply because I’m fascinated by history and the way people lived in times past. I’m always on the lookout for books of historical fiction, especially ones that offer a new perspective about a subject I thought I knew already. The last book like this I devoured was All the Light We Cannot See by Anthony Doerr, which won the Pulitzer for fiction. If you haven’t read it, it is a World War II story from the perspectives of a blind French girl and a German boy. The characters will linger in your mind long after you finish. No surprise I liked that one, but the latest book that caused me to lose sleep and do little else for a couple of days was The Kitchen House by Kathleen Grissom. Last week, after revising my work-in-progress in which I also use the words “kitchen house” to describe the area where Belinda works at Haddon Hall, I remembered it and finally sat down to read. For two days I rarely was without this book in my hand. The story hooked me right away. Here is the first line of the prologue: “There was a strong smell of smoke, and new fear fueled me.” There is unknown conflict here, and I like the first person narrator. The novel spans about twenty years of the main character’s life. Her name is Lavinia, but at the beginning we don’t know that because she has been so traumatized that she doesn’t remember anything of her life. And she’s only a child. The reader learns she is Irish, and that her parents died on a voyage across the ocean, so in the late 1700s Lavinia becomes an indentured servant at Tall Oaks plantation to work off her passage to America. She is set to work with the slaves in the kitchen house. It’s no surprise that Lavinia becomes attached to those who look after her and call her Binia, and therein lies some of the conflict of the book because Lavinia is white and her”family” is black. Again, there are some similarities to my own book here, which is why, I think, I was so intrigued throughout the book. Even now, three days after I finished the last chapter, I find myself thinking about the characters. I wonder about Lavinia and Will, Belle, Beattie, Papa, and all the others. I understand why other readers wanted Kathleen Grissom to write what happens next because I wanted that also. After I finished the book, I hopped onto Amazon to see what else she had written. I was thrilled to find a sequel to this novel was released in April of this year. It’s called Glory Over Everything: Beyond the Kitchen House. Guess what my next book will be! I just reserved it at the wonderful Waupaca Public Library! 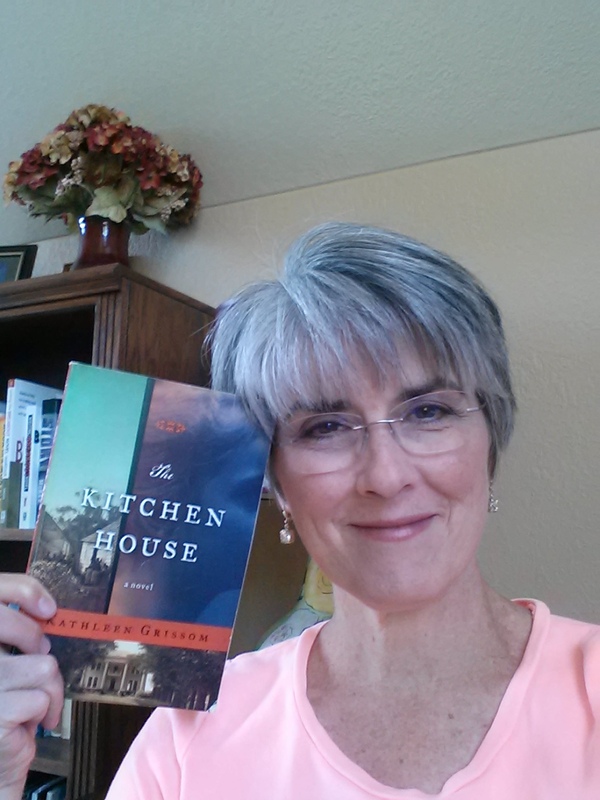 If you are looking for a really good book and don’t mind losing some sleep here in the last days of summer, I highly recommend The Kitchen House, Kathleen Grissom’s wonderful first novel. I’ll let you know if her second book about the people of Tall Oaks lives up to the first. 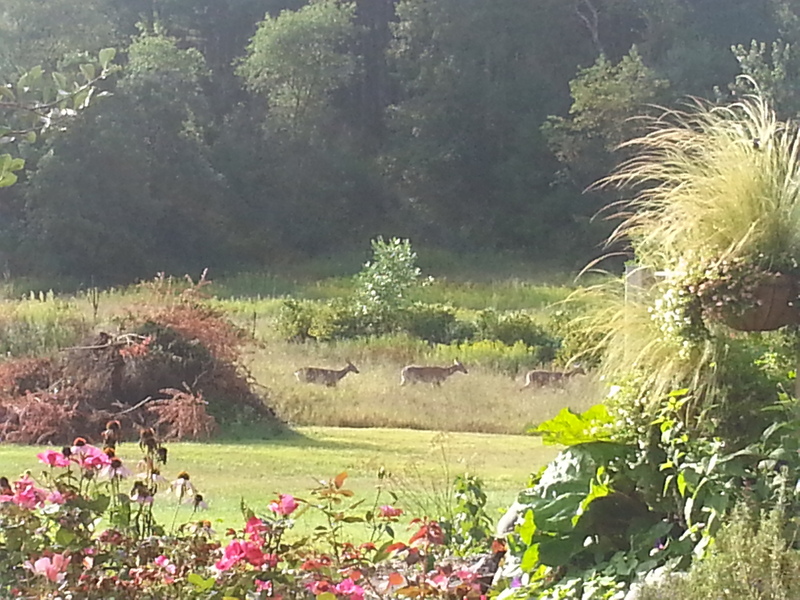 The photo below is completely unrelated to The Kitchen House, but I couldn’t believe my luck seeing a herd of six deer in my yard this morning, so I had to include it here. These three ladies are moving pretty quickly, but they were followed by three bucks with velvet still on their antlers. They were beautiful, but, alas, that picture was too blurry to post! I guess I was too excited to hold still! Adored the book by Anthony . Tried to sell it to so many readers. Want to go to France to see the site. On my bucket list . I loved it too, Janet. I was sad to finish it because I loved the characters. Keep recommending it. It is well worth reading! Thanks for reading my words too! !